A dozen days after launching to great fanfare, Facebook Home isn’t exactly taking the world by storm. But that’s partly by design as the native Facebook Home experience is only available on a relative handful of Android handsets, such as the HTC One. And, Facebook’s stumble toward the future is tripping over the app’s poor design, as well. That is, the Facebook Home app is averaging 2.2 star reviews, a strong indictment of both the functionality on offer and its implementation. That said, Facebook Home has been rated by nearly 11,000 users on Google’s Play Store. Of those, more than 5,600 gave the app a one-star rating — well over half of those who cared enough to say how they feel about Facebook Home weren’t kind. Additionally, Facebook Home isn’t available on the iPhone, the world’s most popular smartphone. Yes, iPhone users get some of the functionality, like chat heads, in the recently released Facebook 6 app, but it’s not the full experience. For what it’s worth, of the 2,228 Facebook 6-specific ratings, well over half (1,284) were one-star. 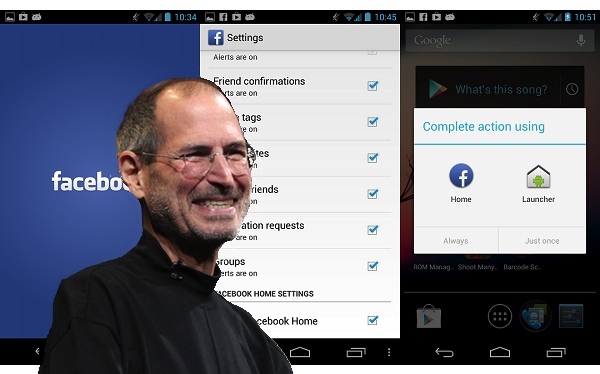 Facebook Home: Doomed by Cupertino? Further, Apple’s tight control of iOS all but obviates the possibility of Facebook Home of ever coming to the iPhone or iPad. It’s not gonna happen and, somewhere in heaven, Steve Jobs is smiling. Why? When Jobs announced iTunes Ping — Apple’s failed social music experiment — Facebook was baked in. However, the social network locked Apple out, forcing the company to remove Facebook functionality after Ping shipped to customers, embarrassing. Although it would be more than a stretch to say that Apple is out for revenge on Facebook or Mark Zuckerberg, it’s not hard to imagine the folks at 1 Infinite smiling at the prospect of Facebook Home failing if only because Apple refused to help.